Purchase tickets online here or email Karen Vrabec at vrabeck@ymail.com! 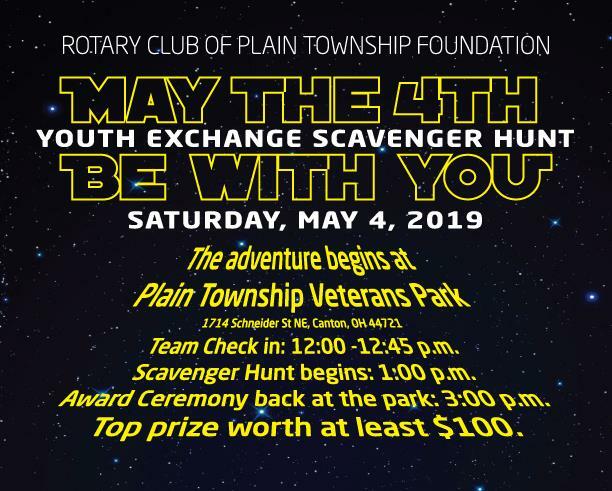 • Scavenger Hunt begins at 1:00 p.m.
• Register teams of 2-4 people. Cost $15 per person. Top prize worth at least $100. • One teammate must be a licensed driver. • Proceeds benefit the Rotary Club of Plain Township Youth Exchange Fund. Youth Exchange is a study-abroad opportunity for young people who spend anywhere from a few weeks to a full year as an international student hosted by local Rotary clubs.